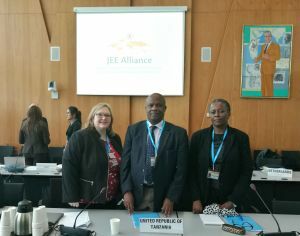 On 22 January 2017 at the JEE Alliance meeting in Geneva, participants gained first-hand information and impressions from Tanzania, the first country to have undergone a Joint External Evaluation in February 2016 and to engage in the country planning process. Professor Muhammad Bakari Kambi from Tanzania’s Ministry of Health, Community Development, Gender, Elderly and Children shared the country’s experience. As a point of departure, Tanzania acknowledged the importance of complying with IHR requirements but considered a self-assessment alone insufficient to provide a true picture of the current gaps. Prof. Kambi described the JEE as an inherently consultative process involving different Government agencies and stakeholders. Whilst the scores were agreed upon in consensus, the Government owned the process and findings. According to Prof. Kambi, Tanzania gained solid baseline information on the current status of its capacities. Importantly, the results are now known beyond the ministry responsible for health, significantly broadening the scope in comparison to earlier self-assessments. After the JEE, Tanzania engaged in the multisectoral planning process to develop a National Action Plan. The plan takes into account the Government’s planning cycle and other ongoing initiatives for improving health systems. The planning process was kicked off on 15-17 November 2016 in Dar es Salaam, where a workshop brought together representatives from relevant sectors nationally as well as from many other post JEE countries, namely Eritrea, Ethiopia, Liberia, Mozambique and Sierra Leone, to enhance mutual learning. Tanzania now has a draft National Action Plan for Health Security that includes identified key priorities and cost drivers. The next step will be to have a detailed costing of the plan and to develop time bound milestones and targets for a multi-phase implementation. Funding gaps and potential funding sources have already been identified. These include domestic funding, Global Partnership, International Development Aid (IDA) by the World Bank, and the Health Basket Fund. The Prime Minister’s Office will guide the implementation of Tanzania’s plan with the support from a high level technical group composed of representatives from all relevant ministries. Tanzania has a clear timetable in place, according to which the costed plan will be submitted to the Prime Minister’s Office by mid-February and launched by the end of March 2017. A resource mobilization event will follow in June 2017. Outi Kuivasniemi, Dr Muhammad Bakari Kambi and Dr Catherine B. Sanga at the JEE Alliance meeting on 22 January 2017. Prof. Kambi identified three key lessons learned in Tanzania. First, the JEE is only the first step of the capacity building process. Investing time and resources is crucial for developing and implementing the actions needed. Second, the process is labour-intensive and requires commitment – there are no shortcuts for lasting results. Lastly, a multisectoral approach within and across sectors is needed, and it has to be aligned with national budgetary processes. Prof. Kambi concluded by calling upon partners to support the work beyond JEEs as well, as addressing the gaps identified depending on countries’ needs and priorities remain a key for long-term capacity building. See Tanzania’s JEE report at the WHO Strategic Partnership Portal.